First Day– It was one of the more surreal moments in my life when I landed in the Shanghai Airport a year ago, and I called my family friends, whom I’ve never met, and with whom I was to stay with until I find my way. Through loose connections, this Shanghainese couple became our family friend, and graciously took me in when they had no idea who I am. I am beyond grateful to always come across such kind people in my life. The kindness softens the layers of strangeness in a foreign land. Beijing Trip– I hopped on a high-speed train to Beijing before I even had time to check out Shanghai. I attended a social investment conference that changed my mind of what career path to pursue during my time in Shanghai. It was quickly evident that the social sector in China is not in a state where I could realistically launch my career. My subsequent experience working with various social start-ups in the months that followed proved this to be true. Furthermore, even in my short few days of visit in Beijing, I knew I made the right choice to move to Shanghai. My personality fits this city far better than Beijing. Move-in Day– Within a month, I decided it was time to be on my own. 4 weeks is plenty long to intrude on even the best of friends, much less people whom I didn’t know previously. Thanks to my family friends’ help, I found a nice studio in one single day, and officially began my life in Shanghai. Over this year, I have created a home out of this new space. 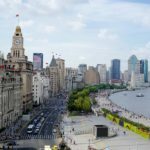 First Wander in the City – One month into my stay in Shanghai, I took a break from networking and interviewing, and running around like a mad woman. Instead, I discovered the city on foot, and finally visited a few touristy destinations – Yuyuan Garden, the Bund (from both sides of the river), etc. I had hand-spun cotton candy, and bought a t-shirt of Obama dressed in a Mao outfit from the Antiques Market. Shanghai was so interesting, yet it took me a month to give it a proper look! Christmas – Within just two month of arriving to a new city, I managed to find a group of friends to spend the holiday with. Friends can quickly become family in a foreign land, and I was grateful to have found people who became family. Some connections are instant, for no rhyme or reason. Chinese New Year– While most expats flee the city during this holiday, I stayed and spent it with a local family. I even followed the masses and went to the temple on New Year’s Eve to pray for good fortune. I was moved by the energy at the temple. The surrounding somehow reminded me of my childhood, and it occurred to me that in some ways, my move to Shanghai has helped me to retrace my ethic roots, and redefined who I am. Philippines Visa Trip– I needed to leave China for my visa, and it was a perfect time to step away from the job-hunting stress and Shanghai life in general. I had a lot of time alone to reflect and to contemplate on my life. Being in a developing country helped me regain perspectives, and helped me make important decisions to better my life. Sometimes it takes stepping away before the hard decisions in life become apparent. Family Visit – My sister spent a few weeks in Shanghai, and my parents also spent some time visiting me. Timing was perfect. I had finally secured a grown-up job, and their visit was during that blissful free time prior to employment. It was so important to have my parents in Shanghai to witness my life, and to see that my crazy decision turned out quite all right in the end. California Trip – My Big Girl Job took me to California for a month. During this month, I became keenly aware of how much Shanghai has become my home. I missed the city’s many quirks, and the pace of life – from one week to the next, you never quite know what may happen, or who may walk into your life. During this month, some of the friends who had become family were leaving Shanghai, whether temporarily or permanently. I returned from this trip and faced the harsh realities of Shanghai’s transient nature. Hiking in Tibetan Sichuan – I had settled into my Big Girl Job, and was already in need of a getaway. I had been so preoccupied in my life that I was in desperate need of time to reflect. This trip offered ample opportunity to think. In addition, I had been seeking people who share more similar interests. This self-selected group of individuals who chose to spend their holiday roughing it in the mountains happens to closely represent the kind of people I had spent time in grad school or the Peace Corps. It’s been a challenging, but incredibly fulfilling year in Shanghai. Timing is everything, and I couldn’t have asked for a better first year in this totally foreign land. Everything has its time and place, and each defining moment is a growing opportunity. It’s pretty cool to literally feel myself growing into the person that I want to become. I am looking forward to what Shanghai, and China in general, has in store for me for year two! Congratulations on your first year. I am so glad it worked out; you took a calculated risk, and it appears to have paid off. It must have been very stressful at the beginning. Now you are the resource for people to come to and ask for advice!